Great paddle today on the Upper Findhorn with Andy, Fiona, Kenny, Jim, Caz and Paul. Levels were probably a good medium-high and the put in at Dulsie gave no time at all to get warmed up; perhaps that was the reason for the three swims?!! Poor Jim got a gash above his eye (stuck back together with Fi’s steri-strips), Caz managed to cling to a rock above the main drop (while I chased her boat down the gorge) and poor Kenny made it all the way to the end, only to trip up on the last wave – almost there matey! But, epic start aside, it was a grand day out on the water, with Andy and Paul showing the lines on U-Bend and the rest of the river moving reasonably quickly with some nice wee waves, a few playful stoppers and a nice roller-coaster finish at JCB. 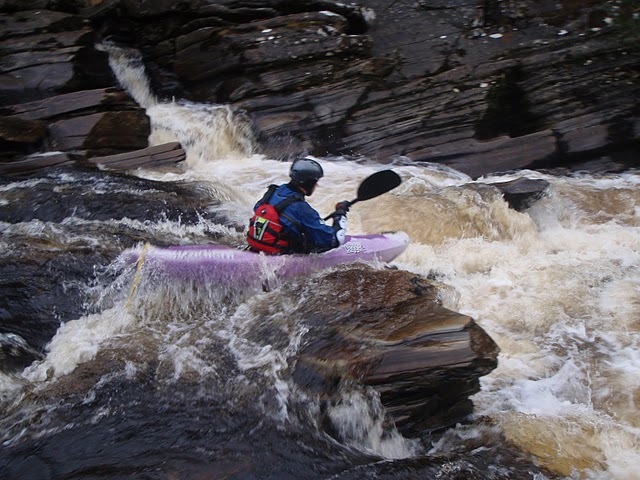 PS – well done to Matt’s BCU 3 Star assessment group who were also on the Upper Findhorn – I heard they all passed! Lovely boat, felt at home it in within minutes. Easy to manoeuvre, easy to roll (not that I had to for real) and really responsive; looking forward to more Nomad paddling to come!